Certainly, my life has changed since the aggravated robbery forced against me, which forced me to start over in many ways. I need to rebuild my music collection, cope with the loss of thousands of photos from November 2008 to October 18th, 2011, and create new artistic and creative forms of expression (five years of schoolwork are permanently gone, save for the files I can obtain from professors or attachments from old emails). And yet, I realized one thing that nobody could ever take away from me. My community work I’ve done has created lasting and fulfilling memories: the two Great American Cleanup events in Clifton, this year’s Make a Difference Day, connecting great people with other great people, and so on. Though the announcement is a bit premature, my fiancee Pam and I have discussed in depth a community project that will fulfill the pants off our bodies. 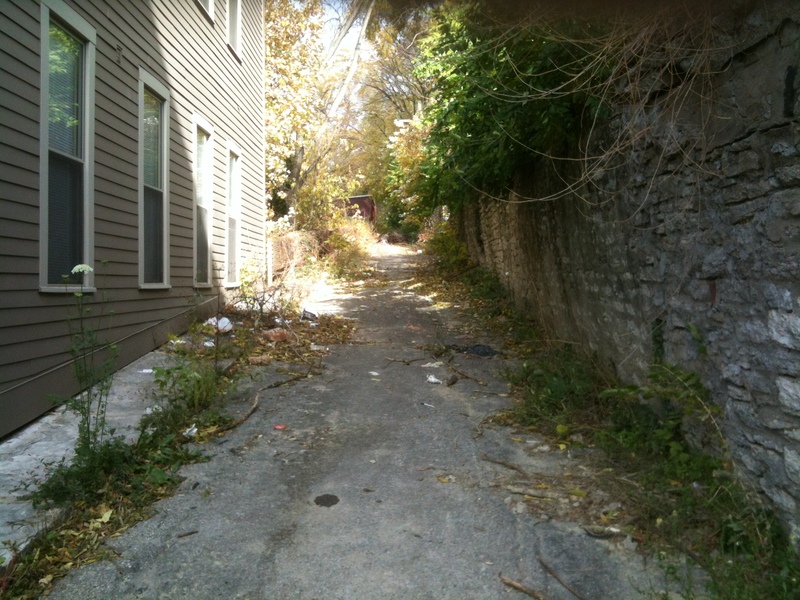 We plan to execute a program designed to clean up neglected alleys, sidewalks, and city steps in Cincinnati. In short, it’s a way to take back the pedestrian realm that no longer serves the users for which it was purposed. The goal is to make these places inviting spaces, possibly causing people to want to use that infrastructure again. The northern section of East Alley, looking north from St. Joe Street into Mt. Auburn from Over-the-Rhine. Another desired result, with fingers crossed, is an renewed interest in these spaces will cajole the City and its partners to reinvest in them. This is not entirely unlike the benefits of Future Blooms, a Keep Cincinnati Beautiful program that revitalizes vacant buildings with beautifully painted window and door placards. Many of those same properties have been slated for redevelopment and reinvestment around them. I will have more news on this project shortly, including details on a planned website where you’ll be able to track our pursuits, future sites, and ways to help out. This entry was posted on December 15, 2011 by C. Huelsman in Alleys and tagged east alley, mt. auburn.